I'm not certain this year has been colder than any other, especially since every year there is at least one day when I'm standing out there in the cold thinking, "What the hell am I doing?" These day always sticks out clearly in my memory, so I can tell you that last year it was March 3rd, and before that, November 23rd, and in 2012, January 20th. The only real solution to this problem is to stop pretending it isn't cold, which is why you can't see my pretty turquoise and crystal necklace from TJMaxx. It was my intention to take the scarf off, but it was so cozy, I decided not to. I'll get it next time. 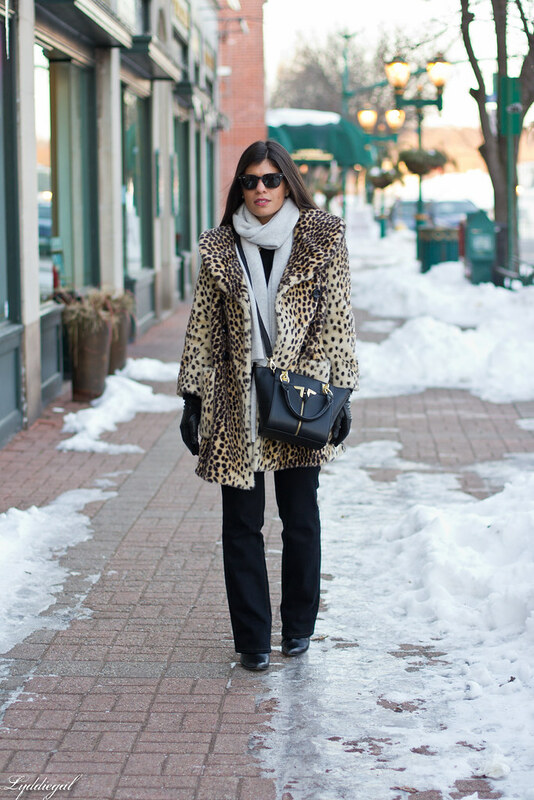 It has definately gotten colder - but you look FABULOUS in your leopard coat! But that coat totally makes the cold worth it, right? I love the little bag! That coat is suuuuuuper chic- I love it! It looks cozy, too- stay warm, lady! Im with you. Sometimes there are those days it feels impossible to take off my pink coat and I'm guilty to taking maybe way too many photos with it. yes, I'm repeat offender. We're real girls and it much more fun to see real then too much staged. You look fabulous in your coat and all black. This outfit looks so rich and luxurious! Absolutely gorgeous. I don't blame you one bit for not wanting to take of your scarf! I kind of have the same take on summers here...stop pretending like it isn't 110 degrees and just go with it! You look like a million bucks. I love the entire outfit, that coat is so luxe and posh. 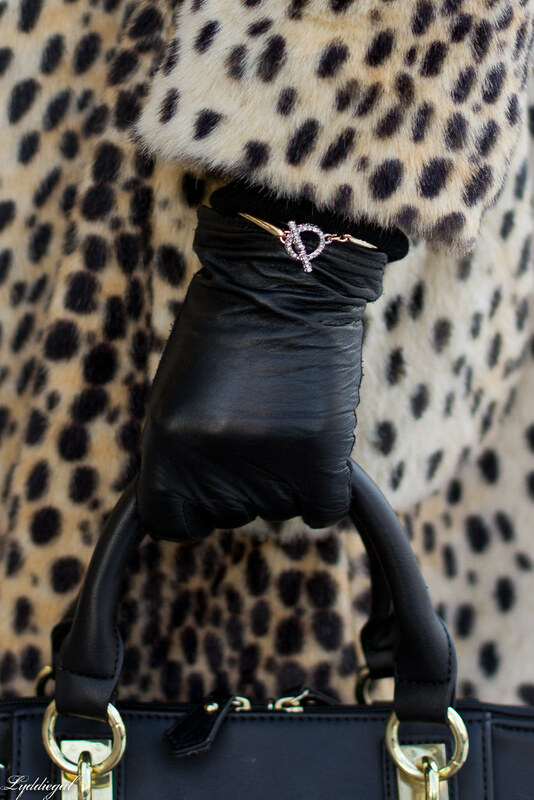 I love the photo of your gloves and bracelet up close, it is the little details that also add to your outfit. LOL I have seriously thought that more than a dozen times when taking outfit photos. I always seem to forget how freaking cold it can get OR how freaking hot it can get in the summers but I have more patience for the latter. Love the coat as always! Love these pictures...can't believe you thrifted those J brand jeans! Yeah that was me this morning like, why am I out here!? 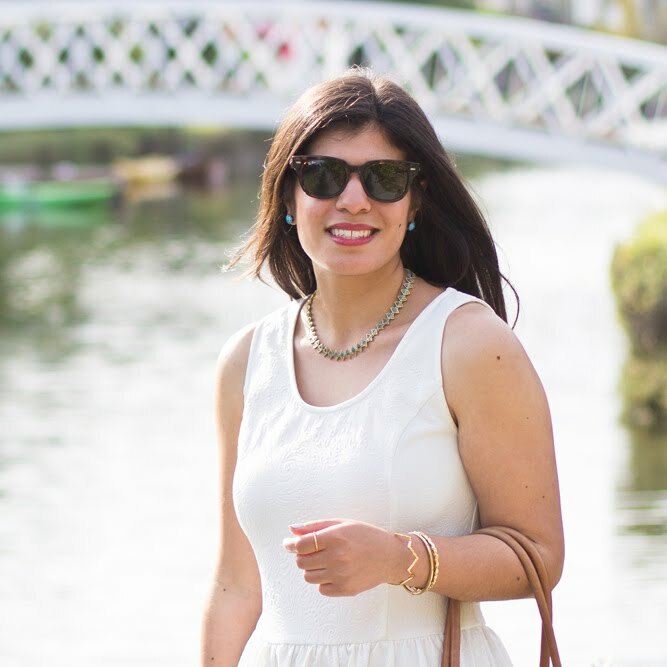 Haha, the things us style bloggers will do for a photo! I LOVE that leopard jacket! It looks so cozy. 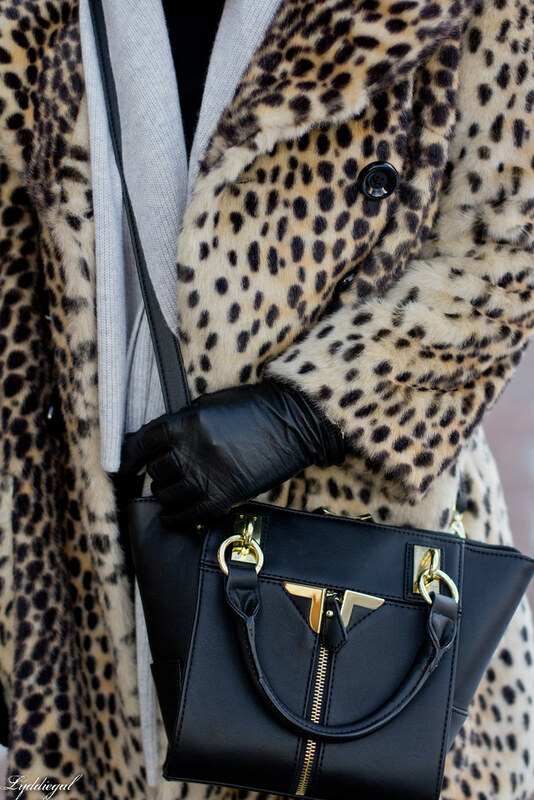 Love all the details of this look, that's an amazing leopard coat! I love that you remember the exact dates of the bitter cold-ness. I think I'd rather black those dates out! You look make bundling up in layers look so chic and glamorous! Ohhh....your furry leopard coat is stunning. Hoping the snow is not affecting you much. You look so chic, I adore this coat. The silver lining is that you have such beautiful coats and accessories to wear! I adore that coat! Oh yes, it's cold but you look so stylish! 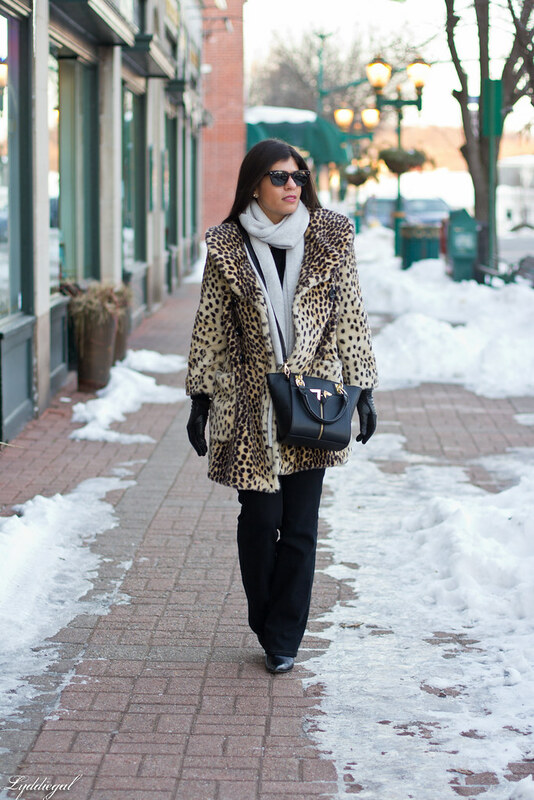 I love all looks with a leopard coat. Our winter had been pretty mild here. I wouldn't mind a few snow days! You look very stylish in the leopard print coat. It might be cold, but at least you have that amazing coat to keep you warm! I wish I had a leopard coat. Apparently this weekend is supposed to be the coldest this year yet...so not looking forward to that. I do love this fabulous coat, I wish I could steal it from you! What a gorgeous coat! You look gorgeously ladylike. Oh that coat is so fabulous! Love it with the wide legged pants! So chic! Love the bag! Your leopard coat is one of my favorite pieces I've seen on you. It's just so fun! You look like a complete diva! Loving the leopard! Another powerful look - you know i had no idea what it was to wear metal jewellery on the skin in the winter until I wore it. I wanted to dieeee when the chain touched my neck. Its those little things that you're not aware of until it happens to you that I admire so much about your pictures in the cold.